G-WAHT’s Rebuild is in Progress. The Albatros is back! 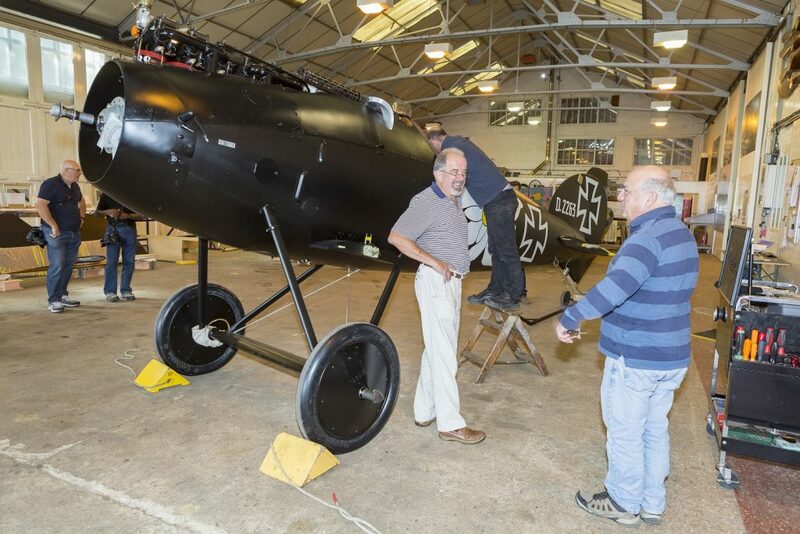 The WW1 Aviation Heritage Trust’s new Albatros is in a different livery to the previous DVa operated by the Trust and is in a striking black paint scheme but still with an enormous Edelweiss. It has yet to fly in this paint scheme and it will remain at Shuttleworth until the Permit to Fly process is complete. The time lapse photo stream of its reassembly in its new colours is being rendered as this is writtten. WW1 AHT is extremely grateful for the Shuttleworth Collection for hangaring the aircraft while it gains its Permit to Fly. The livery was the choice of Otto Kissenberth, a Bavarian, who commanded the Royal Bavarian Jasta 23b and scored 20 victories. He crashed flying a captured Sopwith Camel at the end of May 1918 and never flew again operationally. He died in a mountaineering accident a year later perhaps searching for the edelweiss of Bavarian mythology.